The Mini Tom Brown Tracker knife is designed by Tom Brown as a scaled down survival knife that keeps weight to a minimum. 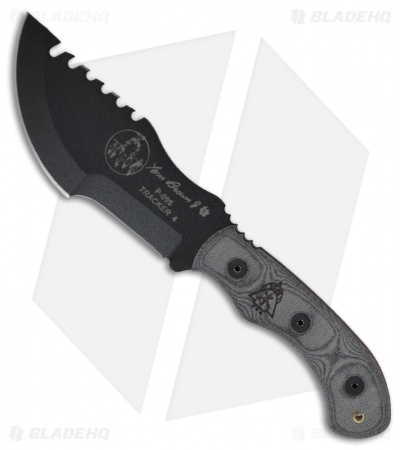 The Mini Tom Brown Tracker has a tough 1095 steel blade with a black traction coating and thin Micarta scales that make neck carry more comfortable and discreet. 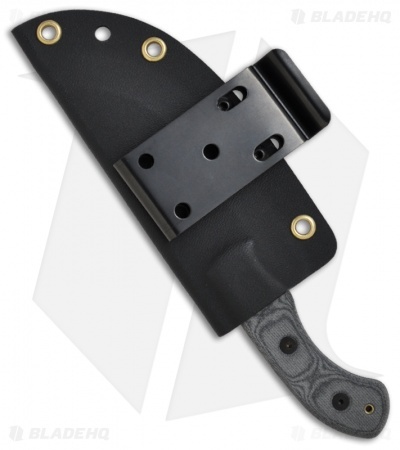 The Kydex sheath features a removable clip for neck carry. I always liked the design of the tracker but it was too big for my needs . I spent years looking at this little guy and found it was exactly what i needed . After a month of carry its big enough to get most jobs done , and small enough to carry every day . I have been able to do everything from Box opening to fire prep , and food prep. Thanks to TOPS for making a great knife , and to Blade HQ. great companies and great knives . I bought this knife as a gift, the only problems I have with it is the sheath is bent in a way that makes the blade hard to draw and it leaves unsightly scuff marks right wear the serial # and tom brown 4 is located on the port side of the blade. I am currently talking to bladeHQ support lines to fix this issue. I still give this knife 5 stars because this is the second time Ive bought this knife the first blade was amazing so much so I bought this as a gift for my brother. I still believe it deserves 5 stars from me, TOPS has the best quality around and Im sure this faulty sheath will be remedied. All in all this is the best EDC around I love the #4 I would highly recommend it.